Fly by post to share with you all today! I made another quick & simple card for the All Occasion swap that I'm in. I can't begin to tell you how happy I am that this sample makes 100 so I only need to come up with 16 more cards & I'm done!!! I have an idea on what the last set will be & can't wait to get started!!! Thanks so much stopping by & have a great rest of the day!!! Stunning, Jackie! Love the shading and this color combo - a beauty!! This is so elegant - equally perfect for a man as for a woman! The pierced corners are really decorative - I might "borrow" this idea for a future card! Very nice card. Elegant and simple. I like that color combination. 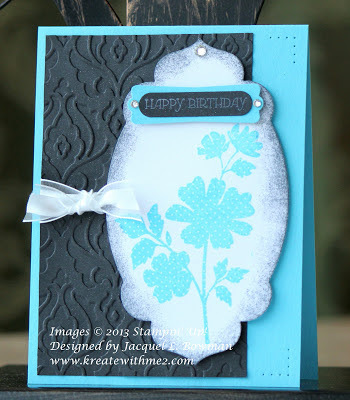 I love how crafers are using these big dies for their sentiments and using them as a focal point on their cards. Love this image you used and the colors are fabulous. What a lovely card, love all the little details on it. Beautiful card...thank you for joining TTCRD this week. So elegant and I love the embossing. Super work Jackie and just perfect for our theme. What a lovely Card. Thank you for joining in with our challenge over at The Cupboard Trilogy Challenge Blog. Very sophisticated. The colours are prefect.